I didn't travel far, and I didn't stay long, but this quick trip went straight to my soul. I didn't take a plane or my passport. I took a short drive, a canoe and a backpack. And of all the places I've been so far, this one is my favorite. 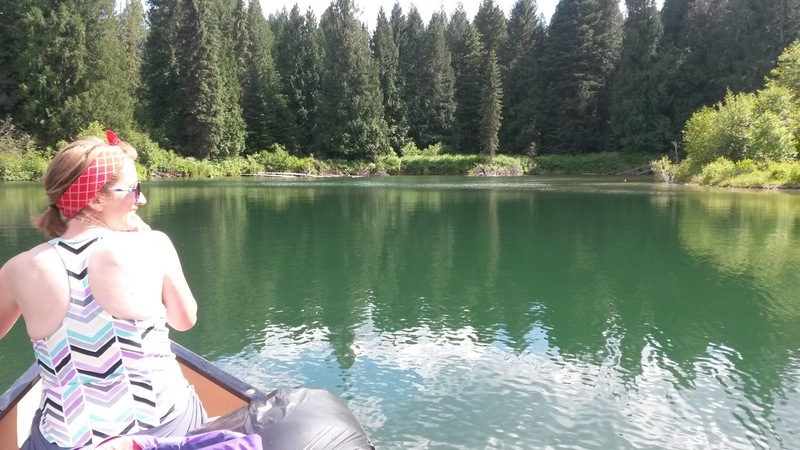 My husband and I loaded the canoe with gear and paddled into white caps on the lower lake. The waves were never big enough to tip us, but it was slow going against the wind and water. 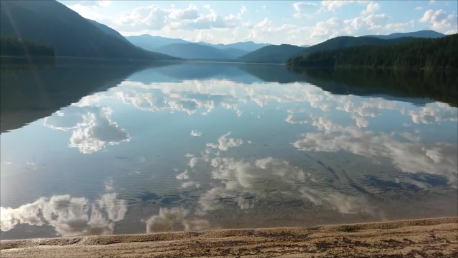 For a while, it felt like the lake wanted us to turn around before we discovered its secret. The upper lake flows through a causeway to the lower lake. I had just finished singing Last of the Mohicans when the water quieted and we discovered that a piece of the Costa Rican jungle had been transplanted into Idaho. Yes, the trees and wildlife were different, but the amount of green was the same. The pictures don't do justice to how the water glowed green. After the rolling lake, the still water made us feel like we'd found something sacred. Watching it was like witnessing art--the whirls and wakes as the oars passed through the water, the line behind the family of Canada geese. Everywhere we looked, mama ducks were busy with their ducklings. Who doesn't love tiny little duck bums sticking up in the air? I wished I could see their sweet webbed feet churning like mad under the water to keep up with mama. We paddled for an hour and a half, but it wasn't long enough. The animal sounds were different than Costa Rica, but just as loud. Peace and quiet? Not really, just animal neighborhood sounds instead of people neighborhood sounds. During the night, a lonely grouse dude was flapping an insanely fast beat with his wings, trying to get a date. He was still at it when we woke up, poor guy. We heard a splash and saw a falcon taking off with a fish, and watched a bald eagle circle. I love people. I really do. But I've never been so happy to not see any. Occasionally, a boat glided quietly past, leaving nothing but ripples in the no-wake zone. Other than that, we were the last two people on the planet, and this was ours. 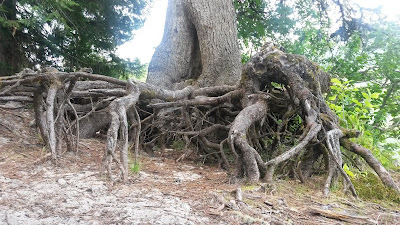 This tree could have been Costa Rican, too, though it's roots were exposed because of erosion, not because it liked to grow that way. Most perfect fort ever made. This, this was the moment, though. I stood for an hour with my toes in warm sand, deciding whether to dive into the sky, or fly into the water.